Adrenaline Packed Adventure on Rivers with II-III & III-IV Class Rapids! 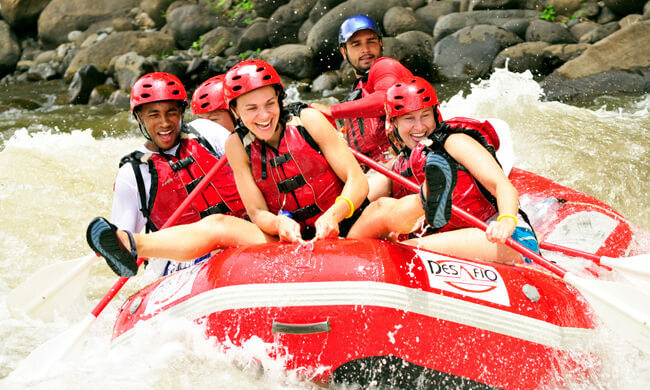 Take part in an adrenaline-filled white water rafting excursion on the Rio Toro, Rio Sarapiqui, or Rio Balsa. The Balsa River offers level II-III rapids and is perfect for beginners, but still challenging enough to make it an exciting excursion! Rio Toro (Bull River) offers more continuous, III and IV class rapids along the deep-canyon gorges, more than any other river in Costa Rica. After a 50-minute drive by 4×4 to the river, the adventure part of your vacation will begin! First, the professional guides will give you a safety talk and paddling instructions before you set off paddling along the scenic river where you can see lots of wildlife like monkeys, sloths, and tropical birds such as ospreys, oropendolas, and toucans. Rafting down Rio Sarapiqui is an option available as an adventure connection tour when traveling from Arenal Volcano area to Puerto Viejo, and vice versa. The tour is available as an easy challenge, with II and III class rapids best suited for families, or a more adventurous section with III to V class rapids for true adrenaline junkies out there! Inquire about the details and tour pricing with your travel consultant. What to bring: Comfortable clothes that will get wet, swim wear, secure shoes (tennis or water shoes), change of clothes. Please note: If river conditions are unsuitable for the Río Toro, our head guide might make the call to change to a back-up river of similar or equal level which is only 20 minutes further and/or offer another tour, such as our half-day white water raft tour on the Río Balsa. We are lucky that our river levels are controlled by the water release of electrical dams so we have excellent water all year long. However, sometimes there is less electricity production on Sundays in Costa Rica, so during the dry season we may have to make a change of rivers or activities.